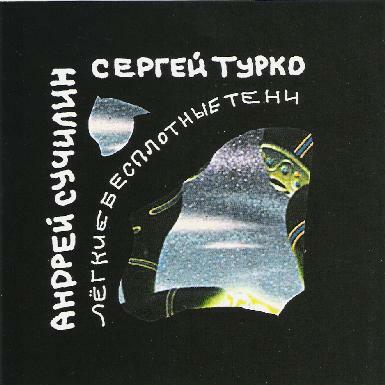 Andrei Suchilin & Sergei Turko - "Tenues Sine Corpore Vitae"
Hailing from Russia, Suchilin and Turko produce some truly inventive, experimental music. Andrei Suchilin is a veteran guitarist and producer, said to be the only Russian guitarist who's studied under Robert Fripp at his Guitar Craft school. He was also a member of the Russian prog rock group Do Major. Sergei Turko is a sound designer, whose original recordings inspired this collaboration. Combining electronics, experimental guitar textures, flute and samples, the music tends towards the ambient style, but some more rhythmic sections crop up here and there throughout, often using a kind of industrial rhythm to propel it along. There are all sorts of things floating around in the mix (I imagine bits and pieces of crumbling cities floating around in iridescent, oily waters) making it a fairly heady sonic environment to inhabit. It can be noisy, but at other times it just flows languidly around and through you. Like all ambient music, at times it tends to fade into the background, but then something else always comes along to draw your attention back. There are no real discernable melodies. Tenues Sine Corpore Vitae is all about texture and color. It's a deep and spacious sound soup full of ideas: swimming, pulsing rhythms, sonic washes of sound, and voices drifting through the detritus of past musical ages. Very cool stuff. For more info in English, check out: http://www.raig.ru/suchilin.asp.